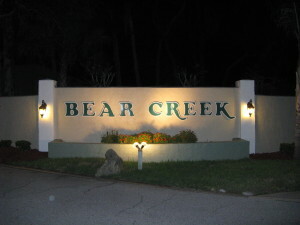 Bear Creek is distinct among 55+ communities situated in Central Florida. With three beautifully appointed clubhouses – each with its own pool and spa – as well as gorgeous natural surroundings, a wealth of amenities, and endless entertainment options nearby, we’re the ideal community for those who want opportunities for fun activities and quiet reflection each day. If you’re trying to decide which 55+ communities might offer you the ideal retirement experience, Bear Creek is the place for you. Clubhouse One offers a “mountain lodge design, featuring a full-sized kitchen, comfortable couches, and a beautiful stone fireplace – a favorite gathering place for the residents of Bear Creek. Clubhouse Two is a more contemporary structure, with a roomy dance floor, a video library, and a large kitchen. Next to this facility are pickleball, horseshoe, shuffleboard, bocce ball, and tennis courts. Clubhouse Three is our newest clubhouse, and features a state-of-the-art fitness center and aerobics rooms, a fully equipped kitchen, and a pool with a spa and waterfall, overlooking a beautiful glimmering lake. Bear Creek is one of five 55+ communities owned by Blair Group, one of Central Florida’s largest developers of affordable lifestyle communities. Since 1986, Blair Group has remained committed to providing a resort-style living experience for those who are living on a retiree’s budget. For more information on what sets Bear Creek apart from other 55+ communities in Central FL, or to schedule a tour of our community, contact one of our friendly Lifestyle Consultants today.